Anyway, in the year that the Queen celebrates her 90th birthday, it’s also a great time to celebrate the wonderful institution of The Royal Family. And we thought we’d combine this with one of our favourite things, another great British institution: afternoon tea. For a thoroughly regal experience just a stone’s throw from Buckingham Palace you can enjoy the Royal Afternoon Tea at the Taj, 51 Buckingham Gate. The tea even features drop scones baked to the Queen’s own recipe and you can’t say that kind of thing very often. Accompanied by miniature Victoria sponge sandwiches, white chocolate crowns, coronation chicken with golden sultanas and smoked Loch Fyne salmon with rocket, the tea is a truly British experience. For another royal tea, you could try the Hotel Café Royal on Regent Street. The London themed tea is served in the spectacular Oscar Wilde Bar and you can enjoy treats which are all based on iconic London sightseeing favourites. Nibble on the ‘Underground’ macaron, Queen of Hearts bakewell tart or the ‘Raspberry Regent’ whilst hearing all about the history of afternoon teas. Knowledge and sugar, that’s quite a heady combination. If you are off to East Anglia and want to visit the Queen’s official residence at Sandringham, why not book in for refreshments before you go. Sadly not with Her Majesty, but your friends don’t need to know that. 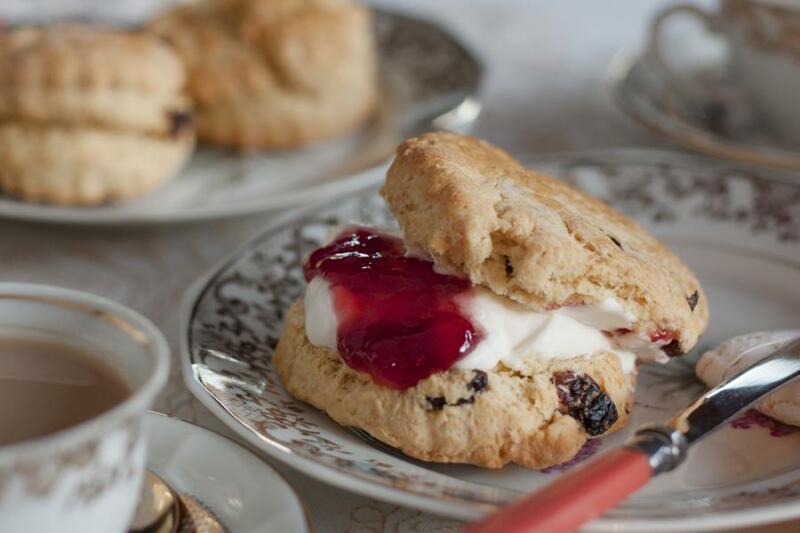 The afternoon tea package includes tickets to the house, grounds and museum as well as tea for two. (There’s a champagne option too – thank goodness!). Either work up and appetite or work off your afternoon snack by exploring the 8,000 hectare estate, or some of it at least. The Sir Christopher Wren is a fabulous place for afternoon tea before or after a visit to the stunning Windsor Castle. In the winter you can sit in the Drawing Room by a roaring fire. From the Thames View Lounge Bar you can watch the local rowers paddling past (sold!). Or on warm days you can sit on the terrace watching the world go by while enjoying sandwiches, scones, cakes and maybe even the Pimms option (now we’re talking!). Afternoon tea in County Antrim. Hollywood style. Slightly tenuous, but we just had to include another royal tea – the Game of Thrones Afternoon Tea at Ballygally Castle in County Antrim, Ireland. The menu is named after some of the characters from the show (Jon Snow cake – yes, it’s that tenuous but we love it!) and the scenery outside the window has even featured in the cult classic.